Boulder Brook in Rocky Mountain National Park is truly one of the park's hidden gems. While the Boulder Brook area is quite popular with hikers, many will just hike along portions of the brook while heading to other destinations in Rocky Mountain. During the fall, the Aspen trees that line portions of this placid, subdued stream shed their leaves and cover the ground around the brook with brilliant yellow Aspen leaves. 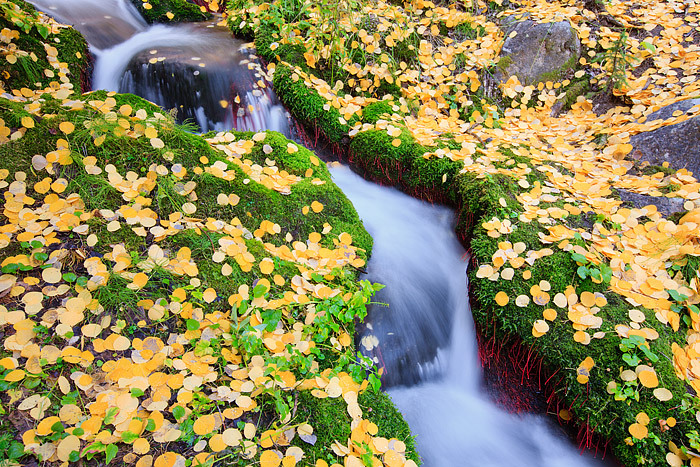 Combine golden Aspen leaves, with vibrant green moss and rock filled stream and you have some of the most subtle, yet beautiful scenery in all of Rocky Mountain National Park. Photo © copyright by Thomas Mangan.